SAN FRANCISCO, Calif. /California Newswire/ — Today, S.F. 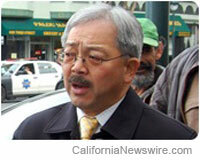 Mayor Edwin M. Lee announced a $4.1 billion capital improvement plan for San Francisco International Airport (SFO). The long-term infrastructure plan provides funding for terminal improvements, facility enhancements, and the creation of an on-site luxury hotel, pending environmental approval. The plan is expected to create more than 36,000 jobs over the next 10 years. Capital improvement projects funded by the plan include renovations to concourse and security checkpoint areas in Terminal 3, a full renovation of Terminal 1, Boarding Area B, and the creation of a 400-room luxury hotel within the airport grounds, pending environmental approval. The San Francisco International Airport Commission will vote on final approval at its meeting on Tuesday, May 21st. San Francisco International Airport (SFO) offers non-stop flights to more than 31 international points on 30 international carriers. The Bay Area’s largest airport connects non-stop with 76 cities in the U.S. on 15 domestic airlines. For up-to-the-minute departure and arrival information, airport maps and details on shopping, dining, cultural exhibitions, ground transportation and more, go to: www.flysfo.com.